BCMC, the RV Specialists and Winner of the 2017 Retail Outlet Award, have recently added a range of caravans to their offering; making them the exclusive retailer of Millard Caravans from Tweed Heads to the Coffs Coast. The new addition nicely rounds out BCMC’s current exclusive distribution of Horizon Motorhomes and Frontline Campervans (north of Newcastle). Millard is a Sydney based manufacturer of caravans, pop-tops and slide ons. Their product is designed for those who like to explore, suiting BCMC’s current customer base, and BCMC will be offering a combination of the most popular and functional options of various layouts, sizes and designs. BCMC Sales Manager Ken Bowden’s involvement with the business spans 10 years and he has extensive experience with both the motorhome and caravan market. He has seen the BCMC business grow substantially and understands the need of extending the business’ product offering to cater for a wider range of touring customers. “Millard is a fantastic organisation dating back to the 1940’s and known as one of the original ‘Big four’ manufacturers when founder Jim Darlington had a dream that more Australians would take to traveling the country if they could do it in comfort, safety and style. We look forward to getting more people on the road this year whether it be in a campervan, motorhome or a caravan” Bowden said. The exciting growth is a timely one as BCMC has been proudly based in Ballina since 1988, thus celebrating their 30th anniversary this year. Co-founded by Clayton Kearney and his late stepfather, Ron Hughes, BCMC now operates over two different sites in Ballina including the recently refurbished showroom in River Street, and the large BCMC RV Service Centre located in the Ballina Industrial Estate. The business now employs 23 staff from the local area. Kearney is also the Managing Director of Horizon Motorhomes, designed and manufactured at the factory in Ballina, hence his team is involved from end to end – design, production, sales and aftersales service. “Having actually designed and manufactured hundreds of motorhomes, we understand what it takes to produce a quality RV. We attribute much of our success to listening to customer feedback. This knowledge and experience will give us an edge on things as we roll the Millard Caravans brand out locally. We will be monitoring and listening as we move forward in this new direction,” said Kearney. BCMC and Horizon Motorhomes have already had a few reasons to celebrate over the past few years, with a collection of awards and accolades including, ‘Business of the Year’ at the Ballina Chamber of Commerce Awards and in 2015 and ‘Best Manufacturer’ at the Caravan & Camping Industry Association for three consecutive years entering them into the Industry Hall of Fame. Here’s a snippet from the Ballina Advocate who ran a story about our new product offering: Caravans are now for sale. BCMC is the exclusive dealership for Millard Caravans (from Coffs Harbour to Tweed Heads), Horizon Motorhomes (nationally), Frontline Campervans (north of Newcastle) and the RV Service Centre caters for any brand RV including, campervans, caravans and motorhomes. Horizon Motorhomes are a specialist manufacturer of built-in motorhomes. 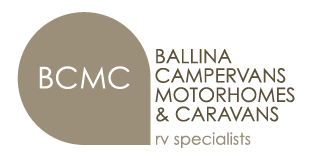 BCMC formerly known as (Ballina Campervan & Motorhome Centre) is now known as Ballina Campervans, Motorhomes & Caravans.